This is a PGY-4 or a PGY-6 rotation intended to give residents a four-week experience in microvascular techniques. Learn the techniques of microvascular surgery. Pursue independent or ongoing research activities. 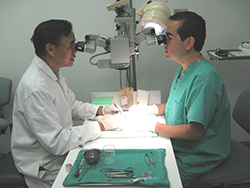 At the conclusion of the rotation, residents should have a knowledge of microsurgical techniques applicable to plastic surgery.